My beloved pets D.J., Maj-En, Panda Girl, and Angel, have touched many lives over the years as well as teaching, motivating, and inspiring me. They have recieved all kinds of rewards, been featured in countless newspapers and yearbooks, and joined with me on TV, at conferences and at statehouses, but changing people's lives for the better is by far their greatest accomplishment. My greatest joy is seeing their joy. 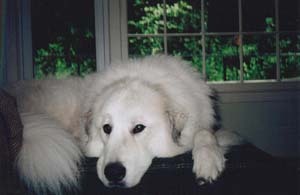 D.J., DOG OF JOY, recently passed away peacefully within the loving arms of her family. 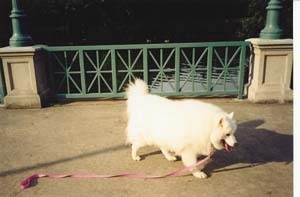 The smiling face of this big white dog is synonymous with professional Pet Assisted Therapy (PAT), locally and nationally, because of the countless people of all ages whose lives she touched, because of the many programs, as well as social reform initiatives that she inspired, because of the many dreams that she helped turn into reality. 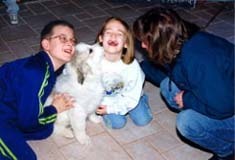 Anyone who recognizes that pets and people are good for each other can turn this moment of sadness into a celebration of D.J.’s life and commit to carrying on her legacy, recognizing that she did more than her part in bringing about a healthier, friendlier, and more peaceful world simply by being herself. D.J. 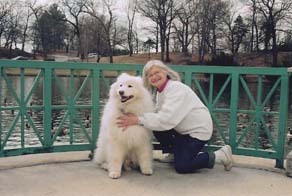 showed me, at a New York nursing home in 1988, how residents could find a renewed joy of life through her loving touch and thus, inspired not only my university program, but also my vision that all universities should have PAT degree programs so that ultimately all facilities could have professional PAT as part of their treatment team. D.J. 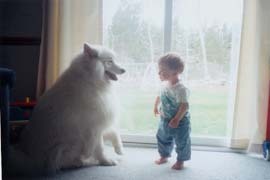 showed me, in my granddaughter’s first-grade class in New York in 1991, how a dog’s strolling up and down aisles and interacting with children could open up their hearts and minds to their responsibilities to pets, people, and themselves. D.J. showed us all the profound and life-changing impact that her freely given love could have on Feinstein High School students, giving them the “heart-opening” opportunity to learn of the positive impact that animals can have in all of our lives through their one-of-a-kind PAT curriculum and the subsequent follow up opportunity to share their love with others through PAT Service Learning. D.J. showed me from the first day of our experiences together that the bond between the therapy pet and the professional is the ethical foundation of this profession, protecting the pet in the field and providing the example from which all else flows. D.J. 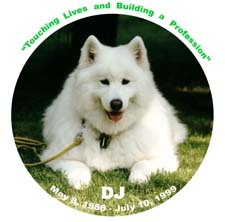 and D.J.-inspired programs have led to schoolchildren writing and singing songs about respecting animals, other people, and themselves; Rhode Island Health Department guidelines for pet therapy; an official state commission; annual D.J. 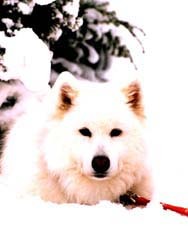 “Respect for Living Things” days on her birthday, May 8th; several Rhode Island agencies having professional PAT programs; the integration of PAT with Service Learning; and Windwalker Humane Coalition for Professional Pet Assisted Therapy, among other programs. Won’t you join my children, grandchildren, friends and colleagues, elementary school students of Central Falls, Woonsocket, Providence, and Feinstein High School students, and students of all ages who knew and loved D.J., in doing all in our power through all our words and deeds to help this magical profession earn its rightful place in health care, education, social services, and society as a whole, spearheaded over the past thirteen years by the smiling face and extended paw of a big white dog named D.J. Maj-En - sunny Maj-En, ambassador of good will, energetic Maj-En, happy Maj-En, or dazzle dog - whatever you call him - Maj-En has and is changing the world for the better. There truly aren't words in the English language, or any other language for that matter, that can capture the impact of interaction with Maj-En. 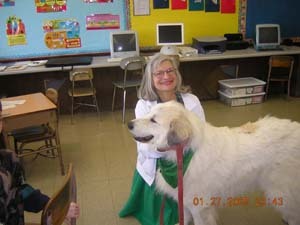 Whether a teacher explaims "A paw for me" as Maj-En enters her classroom, time stops, and 25 children watch as Maj-En gives one paw and then the other, to the kneeling teacher, or whether another teacher observes how Maj-En interacts as he enters her classroom and exclaims "This is a pertfect job for him" it's fair to say that no one who has ever interacted with Maj-En will ever forget him. Those of us caring about a "happier friendlier and more peaceful world" will intuitively know that were Maj-En, or a pet like him, to be in every school and agency, surely the world would be a better place. Maj-En is FUN, Maj-En is LOVE, Maj-En is ENERGY, Maj-En is JOY, Maj-En is MOTIVATION, Maj-En is HOPE, Maj-En is FRIENDSHIP. When my dear frield Tom Vallie, author of two articles in my book, heard about Maj-En as a baby in June of 1996, he commented D.J. will sure be a tough act to follow. Little did he, nor I, know! Maj-En has had the same job for 10 ½ years. Maj-En goes to work everyday with a smile on his face. Maj-En makes the world a better place by his gentle loving presence. Maj-En impacts individuals in ways beyond measure. 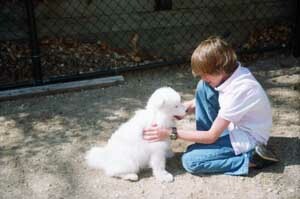 Maj-En brings out in children their potential for gentleness, compassion, joy, and caring, not to mention learning. Maj-En renews in seniors their will to live and their ability to enjoy, thus improving health and enhancing quality of life. Maj-En mesmerizes one and all, and allows for connections among individuals of different walks of life – when otherwise they might not take place. Maj-En dazzles everyone by his beauty, by his friendship, by his unconditional regard. Maj-En enjoys life to the fullest, wherever he is, as he never fails to live up to his namesake, through his MAJestic ENergy. Maj-En inspires --- joy in the moment. So, thank you, Maj-En, for sharing your life with me. What a joy - what a privilege - what unending love. Happy birthday, Maj-En, and many many more to come. 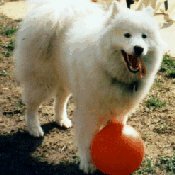 Maj-En, a 14 year old Samoyed, a gift to thousands of Rhode Islanders and dubbed the “dazzle dog” by my dear friend, Miss Alice Freeman, passed away peacefully, lovingly surrounded by his family on February 2, 2009. Through a lifetime, Maj-En dazzled one and all, folks of all ages, folks he knew and didn’t know, folks sick and well, folks anywhere and everywhere, folks in parks and schools, in neighborhoods and agencies and even at the bank and post office. Through sickness and in health, Maj-En, this dazzle dog, who will live forever in our hearts, shared himself and enriched the lives of all around him. Another meaningful occasion occurred on the heart wrenching night of Maj-En’s first seizure, as my 15 year old granddaughter, Frankie Gallucci waited with me at Ocean State Veterinary Hospital at 1:00 in the morning. I was distraught to find out that Maj-En had to stay overnight and the loving words that Frankie said comfort me still - “don’t worry grandma, Maj-En will be doing what he loves to do, he will be visiting.” Her words still comfort me as I can imagine Maj-En still visiting up in heaven with his “bright eyes and angel paws,” his beautiful wagging tail and sensitive ears that move with every new emotion, his howls of excitement as he moves towards someone (anyone), his magnificent thick coat that reflects the sunshine, his majestic energy, his joy of life and love, and his indomitable spirit. So, in honoring Maj-En’s memory and fondly remembering knowing him, let us “visit” on each other peace and joy, love and kindness. Panda Girl - nicknamed "Gooder than good" - is my C&C dog - content and cooperative, and the C's could go on and on, calm and comfortable, etc. Observing Panda with nearly a dozen little ones sitting on the floor around her, with gentle hands touching her ears and tail and body, is almost a spiritual experience. Observing Panda stretch out in the evening as she closes her eyes with a sigh, I can't help but think of the song At The End Of A Perfect Day. Panda continues, at 10 years of age, to share herself, her beauty, her love, and her calming presence with others. 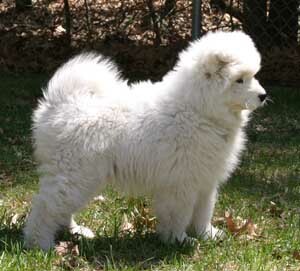 Panda's latest accomplishment, and no small one at that, is welcoming Angel, a seven and a half month old Samoyed puppy, who in the words of my daughter "chews on life." Angel, whose favorite thing in the whole world is chewing on Panda's ears and tail, and walking by balancing her two front feet on Panda's back, also enjoys people. I'm proud to say that Angel has just been credentialed by the Windwalker Humane Coalition for Professional Pet Assisted Therapy after completing puppy kindergarten and my DJ CCRI Course 2. Angel has also endeared herself to one and all in her visits to Elmhurst Extended Care, the Cranston Arc, the Warwick Senior Center, and most recently CCRI. 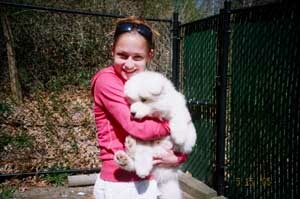 I trust that Angel's future is bright and that he will ably follow in Maj-En's pawprints, my angel up in heaven.